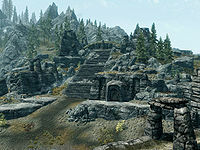 Silent Moons Camp is a Nordic ruin located northwest of Whiterun and inhabited by bandits. The main part of the ruins are built on a hill and consists of a thick semi-circular wall with a walkway along the top around an open-topped dome-like barrow with an enclosed outer walkway around the central area which contains the unique Lunar Forge. The normal approach is from the southwest, where a stone hut on the left can be found as you approach, similar to several huts found at Labyrinthian. It contains two food barrels and two bottles of wine. Past this, by the bottom of a series of flights of wide stairs, on the left is a campfire, with a long wooden table holding two portions of grilled leeks, a baked potato, four salmon steaks and a wedge of cheese. There is also a rack with three whole salmon hanging from it and four food barrels nearby, while on the right is a wooden door leading into the interior. There is also a doorway blocked by a lowered gate in the bottom of the thick wall to the south. There are a number of leveled bandits guarding both the approach and working forge at the top. There is a broken stone table in the outer walkway around the forge with three iron ingots on top. The Lunar Forge includes a complete blacksmith's forge, an anvil, a workbench and a grindstone. On the workbench is a copy of the Smithing skill book Light Armor Forging, a book Notes On The Lunar Forge which describes the forge and an iron war axe enchanted with a unique enchantment, that when the moon is out will burn the target. On top of the grindstone is a lunar iron war axe. There is also an unlocked chest to the right of the workbench. Immediately through the door is an area with distinctly Nordic architecture, with a campfire surrounded by four unowned bed rolls. There is a long wooden table and chairs on your left and a set of shelves in the back corner of the room, holding four bottles of Nord mead. To the right of the fire is a tunnel, with a small table, three food barrels and an empty cart on either side of it. The tunnel descends a short distance to the east, before turning south and opening out into a storage area, where you are likely to find the bandit leader and up to two bandits. In the storage area are four barrels of food, an unlocked chest, as well as clusters of fly amanita, imp stool and Namira's rot fungi. There is also a tunnel to the east, which turns immediately south and descends to a pair of adept locked iron double doors. A bandit will be guarding these and will be alerted to any fighting above. There are two food barrels and a woodcutter's axe to the left of the door. Through the doors is a room with a ladder in the middle, with an unlocked chest to the right. Around the walls are two large and one small sets of shelves holding a solution of health, a potion of health, a philter of regeneration, three potions of extra magic, a potion of enhanced stamina, a potion of plentiful stamina, a lunar steel mace, three loose septims, a bottle of lingering stamina poison, two seared slaughterfish steaks, a bowl of troll fat, a sample of hagraven feathers and some bread. Hanging from the ceiling is a rack holding two bunches of dried frost mirriam, a garlic braid and a rabbit. There is also a lever behind the door to the left, when entering the room, which operates the door you entered through. The ladder exits inside a tower containing an unlocked chest and a chain to the right of the doorway, which raises the gate blocking access. There is an upper floor within the tower, however this can only be reach by climbing part way up the hill and dropping down to it from the outer wall. On the upper level is a long wooden table holding a lunar iron sword, a draught of health, and a potion of regeneration, with a potion of enhanced stamina, on the floor under the table. To the right of the table is a food barrel and against the west wall is a set of shelves holding two random potions of healing, magicka or stamina and an iron cuirass. You can not actually use this forge to create lunar enchanted weapons, although you can disenchant one of the weapons and then create your own using any arcane enchanter. South of the barrow is the head of a dry stream bed; on the east side of the bed are two silver ore veins. Two moonstone ore veins are located 410 ft north of the camp. One gold ore vein can be found on a small hill to the northeast, in the direction of Halted Stream Camp. Nothing in the tower, except one of the random potions on the set of shelves found on the upper floor of the tower, respawns. The gate to the tower stays open and doesn't reset when the location respawns. Humorously, the bandits occupying the camp may inadvertently draw the ire of the mudcrabs from the nearby stream; the mudcrabs will then launch an assault of sorts on the camp and may very well succeed in clearing out the bandits from the camp exterior at lower levels. A permanently disabled copy of the skill book Heavy Armor Forging is placed here. This page was last modified on 28 March 2019, at 12:06.